Ivy Cottage in Goathland, near Whitby, Yorkshire sleeps 8 people. 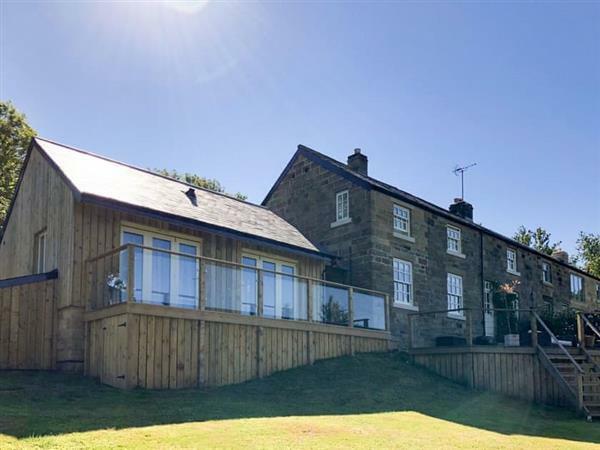 Ivy Cottage near Whitby is close to the village of Goathland; Ivy Cottage, is a luxurious, semi-detached cottage with fabulous views of the surrounding countryside. The original building was built in the 1800s and has been renovated to a high standard with a modern décor. The kitchen/dining room has a real social feel, and is ideal for sitting down to a meal with all the family. The living room offers a warming multi-fuel burner, perfect for relaxing in front of after a day of exploration. The ground floor bedroom is ideal for less mobile guests and even has doors leading out onto the decking with views over the North York Moors Railway below, as well as an en-suite bathroom. Three more bedrooms can be found on the first floor, one offering en-suite facilities, as well as a family bathroom. Ivy Cottage is situated just outside the hamlet of Beck Hole, one of Yorkshire’s best kept secrets, and just outside the village of Goathland from the Heartbeat TV show fame. This stunning cottage is just a short walk from one of the smallest pubs in the UK, known for its traditional ales and warm friendly welcome. Stunning valleys and sweeping hillside views can be enjoyed from this idyllic location as can the many cycle tracks, bridle paths and walkways all from the doorstep. Nearby Whitby is increasingly popular with holidaymakers all year round as it has something to offer all the family, including 3 miles of golden sandy beach, donkey rides and ice creams. Climb the 199 steps to the gothic Whitby Abbey, which was made famous by Bram Stoker’s Dracula, or take a stroll along the cobbled streets taking in some of the older parts of town with its Jet Stone boutiques. Whitby has an up and coming foody scene too, with everything from Michelin star restaurants and award-winning fish and chips, to tea rooms and family friendly pubs, many of which are dog friendly. There is also a golf course nearby and many boats offering tourist trips out to sea in search of seals, dolphins and even minke whales in the right season. The Yorkshire Heritage Coast is dotted with hidden gems such as Staithes and Runswick Bay to the north, and Robin Hood’s Bay to the south. Robin Hood’s Bay can be reached along the Cinder Track walk and cycle way, and the Cleveland Way also makes its way along the tops of cliffs and into the some of the bays, offering superb photo opportunities along its path. The North York Moors National Park is right on the doorstep, with its hundreds of walking routes which take in the Falling Foss Waterfall and The Moors National Park Centre. The beach is 9 miles from Ivy Cottage near Whitby. With the shop and restaurant 2 miles; and the pub is ¼ mile from Ivy Cottage. Living room: With multi-fuel burner, 42 Freesat Smart TV, DVD player and Bluetooth speaker. Kitchen/dining room: Farmhouse style, with Range, electric oven, electric hob, microwave, fridge, freezer, dishwasher and wooden floor. Garden room: With double sofa bed (for flexible sleeping arrangements) and French doors leading to terrace. Bedroom 1: With double bed, door leading to terrace, and en-suite with shower cubicle and toilet. Bedroom 2: With double bed, single sofa bed (for flexible sleeping arrangements), dressing room and en-suite with shower cubicle and toilet. Bedroom 4: With day bed and pull-out bed. Oil/electric central heating (under floor in bedroom 1), electricity, bed linen, towels, Wi-Fi and fuel for multi-fuel burner included. Welcome pack. Large, enclosed lawned garden with decked terrace, sitting-out area and garden furniture. 2 small dogs welcome. Private parking for 4 cars. No smoking. Pets allowed at Ivy Cottage. For a better idea of where Ivy Cottage is, you can see Ivy Cottage on the map below. Ivy Cottage is in Lancashire; should you be on the lookout for a special offer, you can find all the special offers in Lancashire. It's always worth checking to see what is on offer at the moment. Do you want to holiday near Ivy Cottage (UK2594), you can see other cottages within 25 miles of Ivy Cottage; have a look to find your perfect holiday location.